The Blue Tick Coonhound is thought to have been bred in Louisiana from the English Foxhound, Cur, and Bleu Gascogne French hound. It was bred to ‘tree’ raccoons and other prey, which means to track them as they flee through the treetops and pursue. Stringfellow Hawke, the main character of television show ‘Airwolf’ had a pet Blue Tick Coonhound named ‘Tet’ who was a popular character. The Blue Tick Coonhound is the state dog of Tennessee, and a Blue Tick Coonhound named Smokey serves as the University of Tennessee mascot. 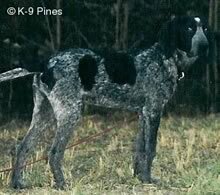 Blue Tick Coonhounds are also the subject of Neil Young’s song ‘Old King’, Charlie Daniels’ ‘Long Haired Country Boy’, and Blake Shelton’s hit song ‘Ol Red’, in which a convict successfully uses a female Blue Tick Coonhound to seduce the warden’s Bloodhound during his escape from prison. The Blue Tick Coonhound has a shoulder height of 51-69 cm (20-27 in) and weighs 20-36 kg (45-80 lbs). Blue Tick Coonhounds are lithe and muscular in appearance, with head and tail carried high. They have a large, rounded head with pronounced stop (depression where the muzzle meets the forehead), low-set ears, square muzzle, and large upper lips (‘flews’). The Blue Tick Coonhound has an arched, muscular neck, sloped back, deep chest, and round ‘cat feet’ with unusually large paws. There is a subgroup of the Blue Tick Coonhound known as the American Blue Gascon (or sometimes ‘old fashioned Blue Tick Coonhound’) which is larger, heavier, and more hound-like in appearance. The Blue Tick Coonhound has a short, slightly coarse, glossy coat. Its distinctive navy blue coat comes from black and white mottling. Black markings on the head and ears are permissible; black is also allowable on the body but dark blue should predominate. The Blue Tick Coonhound may have tan dots on the forehead and cheeks and/or dark red on the chest, lower legs, and feet. The Blue Tick Coonhound is loyal and intelligent. It has a variety of barks for different situations and makes an excellent watchdog. Blue Tick Coonhounds are good problem solvers who should not be restrained to a small house or yard. They bark frequently and tend to drool, especially when they smell human food. The Blue Tick Coonhound is loyal and intelligent. It has a variety of barks for different situations and makes an excellent watchdog. Blue Tick Coonhounds are good problem solvers who should not be restrained to a small house or yard. They bark frequently and tend to drool, especially when they smell human food. The Blue Tick Coonhound will bark at and sniff strangers, but this is actually their method of greeting and does not indicate aggressiveness. The Blue Tick Coonhound is always ready to sound the alarm when bothered by someone or something creeping around. Blue Tick Coonhounds have a high tolerance for children and other animals, provided they have been socialized when young. You can find Blue Tick Hound puppies priced from $150 USD to $800 USD with one of our credible breeders. Browse through our breeder's listings and find your perfect puppy at the perfect price. The Blue Tick Coonhound will bark at and sniff strangers, but this is actually their method of greeting and does not indicate aggressiveness. The Blue Tick Coonhound is always ready to sound the alarm when bothered by someone or something creeping around. Blue Tick Coonhounds have a high tolerance for children and other animals, provided they have been socialized when young. The Blue Tick Coonhound requires minimal grooming as the fine coat sheds very little. The ears should be checked regularly for infection. Blue Tick Coonhounds have a lifespan of 11-12 years. The Blue Tick Coonhound is intelligent but can be challenging to train. Its tendency to mark its territory makes house training difficult. The Blue Tick Coonhound requires a vigorous daily walk, but does not mind relaxing around the house and spending time with its family. The Blue Tick Coonhound’s favorite activity is chasing a scent. Blue Tick Coonhounds are not recommended for apartment life due to their high space requirements. Blue Tick Hound Puppies for Sale - Shipped Worldwide! Finding the right Blue Tick Hound puppy can be dog gone hard work. PuppyFind® provides a convenient and efficient means of selecting and purchasing the perfect Blue Tick Hound puppy (or Blue Tick Hound puppies) from the comfort of your home, 24 hours a day, 7 days a week. Take advantage of our PuppySearch or leisurely browse our directory of hundreds of dog breeds, Blue Tick Hound dog breeders, Blue Tick Hound dogs for adoption, and Blue Tick Hound puppy for sale listings with photos and detailed descriptions. Some Blue Tick Hound puppies for sale may be shipped Worldwide and include crate and veterinarian checkup. Many Blue Tick Hound dog breeders with puppies for sale also offer a health guarantee. With thousands of Blue Tick Hound puppies for sale and hundreds of Blue Tick Hound dog breeders, you're sure to find the perfect Blue Tick Hound puppy.